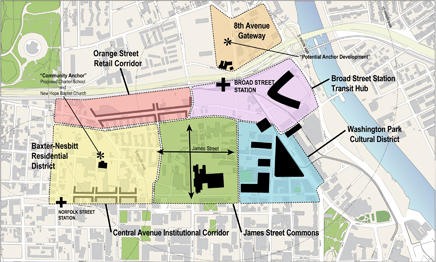 The Broad Street Station and Living Downtown Redevelopment Plans — the first centered on a strategically located but underutilized transit facility, the second focused on the use of residential conversions as a catalyst for downtown revitalization — represent two outstanding models in New Jersey’s largest city of planning that embraces smart growth principles and is premised on sustainable economic development policies. One of the primary goals of the Broad Street Station Redevelopment Plan is to increase ridership at Newark’s Broad Street rail station, and to leverage it as a viable alternative to vehicle transportation for office workers, students, residents and other visitors to downtown Newark. City planners worked extensively with universities, institutions, community groups, private developers and resident stakeholders, and incorporated more than a dozen development plans, many of them site-specific, into one comprehensive plan for the entire redevelopment district. While the plan sets the stage for catalytic new development, it focuses just as much on preserving existing historic resources and neighborhood character and enhancing existing open spaces, including a listed historic district and two historic parks. The plan promotes creation of a transit-oriented neighborhood of mixed-use, mixed-income developments that will be supportive of many transportation choices. It encourages increasing housing densities and leveraging compact building design to support greater quantities and varieties of affordable and low-income housing at all levels of affordability. It enhances the walkability of the neighborhood by planning strategically for streetscape improvements that achieve a combination of greening streets, enhancing lighting conditions, widening sidewalks, calming traffic and installing bike lanes to foster a greater sense of safety and enhance neighborhood character. A unique provision in the plan sets maximum limits on parking and requests that institutions and businesses prepare vehicle-miles-traveled reduction plans. The Living Downtown Redevelopment Plan sets forth a vision for a revitalized, vibrant and sustainable downtown Newark using residential development as a primary catalyst. The main goal of the plan is to spur new development in Newark’s historic downtown, primarily through residential conversions of existing building stock, and thereby to foster development of a district that regains prominence as a regional center for commerce, entertainment and urban living. The plan builds on revitalization strategies in comparable downtowns, including Center City Philadelphia and Oakland, that center on a “living downtown.” Informed by detailed and diverse input from the city’s institutional, business and resident stakeholders, the plan represents a comprehensive vision for Newark’s central business district — replacing a diverse collection of plans, all covering different boundaries or concentrating on specific rather than comprehensive goals. The plan advances smart growth principles. It enhances the inherent walkability of downtown Newark by ending suburban-style patterns of development and mandating more traditionally urban and transit-oriented types of development. Adaptive reuse of existing buildings and new development that leverages existing infrastructure will make the whole region more sustainable as it continues to develop. The plan outlines a strategy for the evolution of new downtown neighborhoods, each with its own unique character, as residential population grows. To this end, the plan ended zoning provisions that were burdensome or inconsistent with promotion of new, high-density residential development. 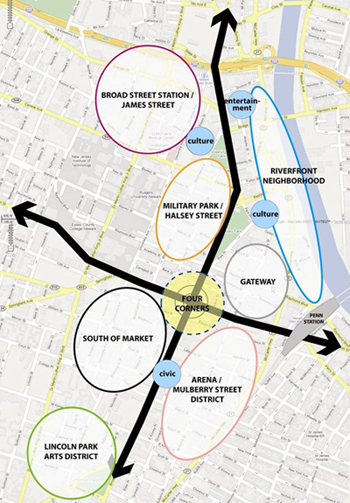 The Broad Street Station and Living Downtown Redevelopment Plans help to implement the State Development and Redevelopment Plan. Newark is a designated an urban center in the State Plan, where intense land development is encouraged, particularly within in its downtown area. These two redevelopment plans encourage rehabilitation and spur new development in an area that is rich in infrastructure; promote development of brownfield sites; and bring new life to downtown areas with abundant but under-appreciated historic, cultural, scenic, open space and recreational value. Supporting Partners in the project are: Cogswell Realty Group, LLC; House of Prayer; James Street Commons Neighborhood Association; Newark Museum; Newark Public Schools; Newark Regional Business Partnership; NJIT; NJ TRANSIT; Regional Plan Association; and Rutgers University.